KRAAK | Various Braublff (materie und laut)"
BRAUBLFF is an archival piece with exclusive work by Gerhard Rühm, Alessandro Bosetti, Tomomi Adachi and ArfArf. 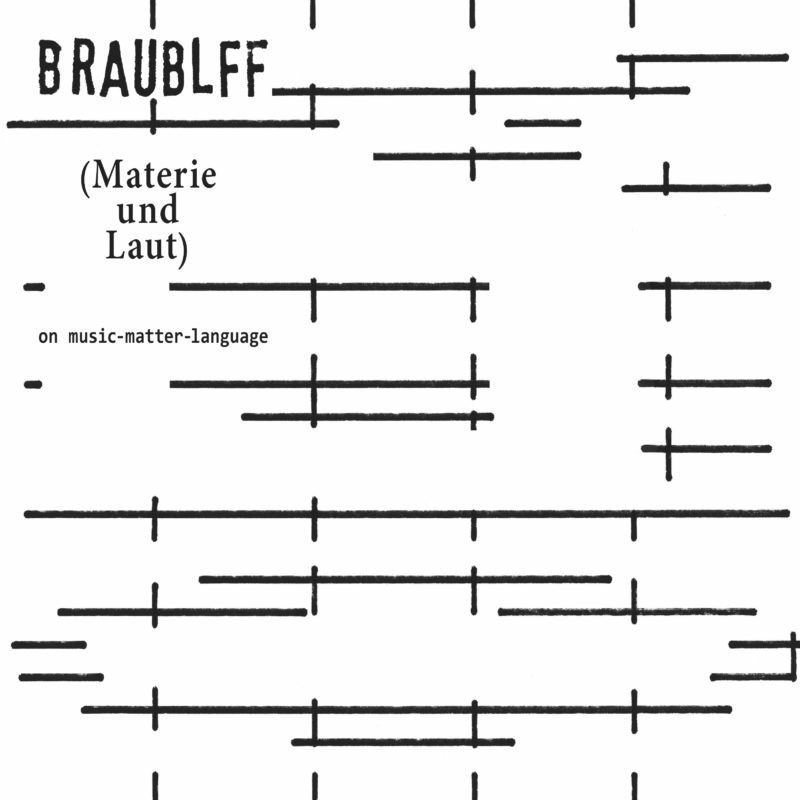 BRAUBLFF (Materie und Laut) is a series of live events organised by DE PLAYER (Rotterdam) and KRAAK (Ghent) and brings together contemporary vocal poets, text-sound composers and language-based artists with the pioneering work of the avant-garde. A possible answer: “At the point where language loses its meaning and becomes pure matter through de/re-construction and mutation, which is made possible by (new) technologies, inventive manipulation and/or particular unconventional use of sound and text within artistic contexts”. The idea for this series of events originated from a shared obsession for the work of vocal poets such as Henri Chopin, Maurice Lemaitre, Sten Hanson, Lars-Gunnar Bodin, Bob Cobbing, amongst others, and Lazlo Maholy Nagy’s notion of New Plasticism, which is based on the idea of stimulating acts of abuse and malfunction in order to produce a result, which is, in principle, embedded in the specific character of human nature. Tomomi Adachi (jp) is performer, composer, vocal poet, installation artist and occasional theatre director. He studied philosophy and aesthetics at the Waseda University (Tokyo). As a performer he improvises by means of vocals, live electronics and self-made instruments. Quintessential are his compositions for the punk choir Adachi Tomomi Royal Chorus. He is also renowned for his interpretations of legendary works by John Cage, Cornelius Cardew, Christian Wolff, Tom Johnson, Dieter Schnebel, Takahashi Yuji en Yuasa Joji. In real Beavis and Butthead style, he brought to stage for the first time in Japan works by Cage and Kurt Schwitters. Alessandro Bosetti (it) is a composer, performer and sound artist. He digs deep into the musicality of spoken language and the sound characteristics of language based communication. He (mis)uses miscommunication, translation and interview techniques for his compositions, blurring the lines between electro acoustics, aural writing and performance. Bosetti is one of the most innovating radio makers, specialised in hybrid text-sound compositions. His CV is impressive: concerts a.o. on the GRM/presences electroniques Festival (Paris), Roulette (NY), Café Oto (London), and many awards: a.o. Phonurgia Nova Price 2012 and the IDAF Prize 2013. Gerhard Rühm (at) was born in Vienna in 1930. He began by studying composition and Oriental music, but came to devote most of his energy to literature, esp. concrete poetry. His aim has been nothing less than making language an aesthetic medium on a par with music and visual art. He is a radical experimenter, a restless explorer of traditions and genres, atomizing their elements in order to recompose them with conceptual precision and a multiplicity of compositional techniques. All becoming a very disciplined practice of limitation and constraint.